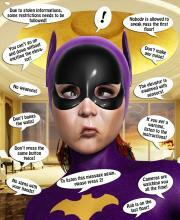 The Further Adventures of Batgirl - Going up? @culmor - Is it the end of the story? (15 Sep 2017, 20:55 )Like Ra Wrote: @culmor - Is it the end of the story? Nah, not so bad at all! That's Batgirl, by ycbatgirl There are several threads elsewhere in this site. Current time: 22 Apr 2019, 06:49 Powered By MyBB, © 2002-2019 MyBB Group.